Buying used furniture has many advantages, and Millwill Furnishers have provided a selection of the main reasons why you should consider buying used furniture items instead of brand new items. You might consider buying used furniture for various reasons, but the cost is usually the most enticing aspect. Saving some money is the main reason why most people buy used items. 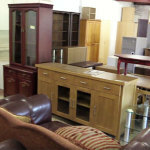 Considering that new furniture can be expensive, you can save a lot of money by buying quality used items. Take for example items like bookcases and display cabinets, such items can experience very little wear and tear, making them an ideal choice for used furniture. Today’s furniture market can be flooded with low-cost items, where the build quality and materials may not be as high quality as expected. If you are looking for furniture that meets high-quality craftsmanship and materials used (while still affordable), it can be advisable to look for quality used items. Making use of pre-owned furniture helps our planet a little bit each time. Disposing of wood furniture or steel furniture is not particularly great for the environment. By reusing items you are finding the chance of owning a product of high intrinsic value and helping to reduce waste/recycling costs at the same time. Repurposing furniture and other Décor materials is a popular trend in today`s design. The internet has plenty of useful ideas which can be applied to refurbish used or old furniture. This includes helpful solutions on how to repaint, repair or even redesign any piece of furniture. Once you buy a used furniture item, you can design it how you want and give it a colour of your choice. No one will even notice its a refurbished item. Most of us want to be unique, especially when expressing our personality with the furniture we put in our homes. No one wants to have something that is the same or similar to their neighbours or friends home’s, so shopping for used furniture provides an exciting opportunity to find a very rare piece. The resale value of brand new furniture items depreciates to a cost considerably lower than the original one. Be that as it may, purchasing quality used furniture offers an opportunity to sell again at a relatively high value, and sometimes even higher than the original depending on various factors. It’s a worthy investment unlike purchasing new furniture. If you have any questions or queries regarding used furniture, please feel free to pop in-store to have a chat or give our friendly team a call today.